In the centre of more modern buildings is this rather more handsome red brick building, presumably the original part of the factory, which opened here on Huntington Road in the 1920s. 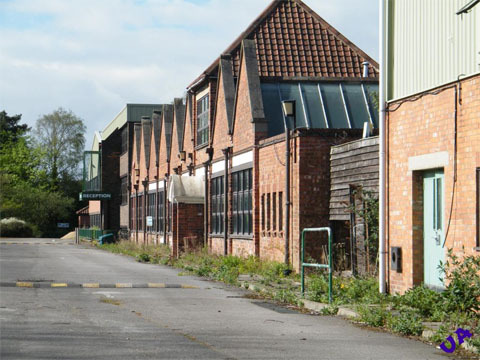 A planning application has been submitted to demolish the factory and build housing on the site. Inevitable, no doubt, but this place, so much a part of York for so many decades, deserves recording before it’s gone. Several photographers have, and I’m using some of their recent images (with permission). Sessions had a long history in York. The business was founded by Quaker William Alexander in 1811, as a bookshop and stationer’s, continuing under the Sessions name from 1865. 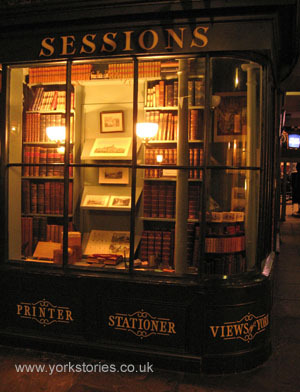 As is the case with other lost York businesses, it is remembered in the form of a replica shopfront in the Castle Museum, with painted lettering advertising ‘Printer’, ‘Stationer’, ‘Views of York’. The company later focussed on printing, and had a print works in North Street before moving here to Huntington Road. 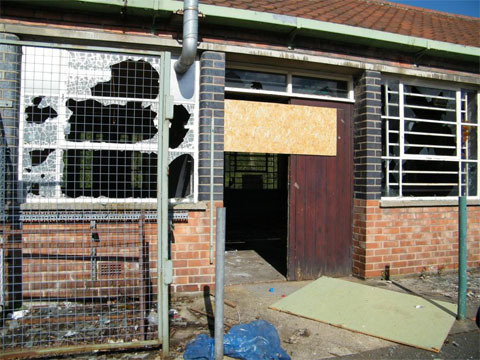 Rather sad to see the factory in this state now, windows smashed. 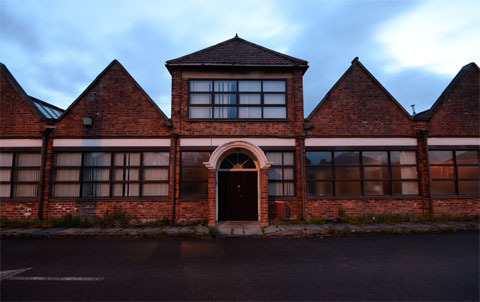 We may have kept the Terry’s factory buildings and part of the old Rowntree factory, but there’s no chance of these being preserved and obviously no chance of their being reused for an industrial purpose. The most pressing need is for new housing. Some locals are clearly so eager and impatient for this new housing that they’ve already started on the demolition of the factory. 2010, a photo I took when passing one evening, after Sessions had gone into administration. The business had been put up for sale the previous year. Its label printing division was bought and continued operating at this site until late 2011. It’s not that long then, since closure, but the front of the premises already looks as if the place has been abandoned for decades. The tidy trimmed hedges have gone and weeds grow in the cracks in the paving. 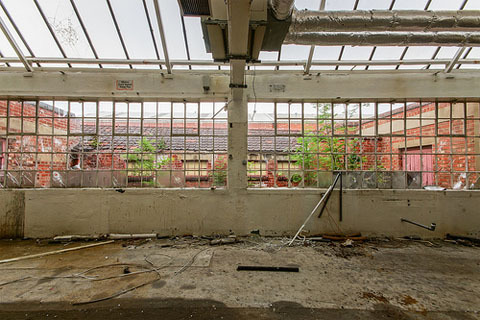 From inside the factory, a view of weeds and shrubs waving their leaves outside the broken windows. 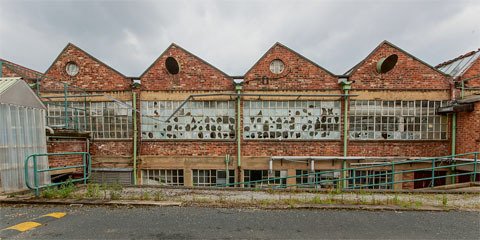 Nature’s reclaiming of the place would have been no surprise to Bill Sessions, who was a great supporter of the natural environment and wildlife conservation and had established a nature reserve alongside the factory, near the Foss. It doesn’t seem to be mentioned much in accounts of this factory’s closure, but alongside the commercial printing Sessions had for decades published books on Quaker history and also many books on York and Yorkshire, which must also have been printed here. One particularly fine example from recent years is ‘York’s Green Places’. Every home in York should have a copy. It’s a carefully compiled and extremely useful guide to some places we may be familiar with, others we may have overlooked. It also has a photo of mine on the back cover, and other photos of mine inside. 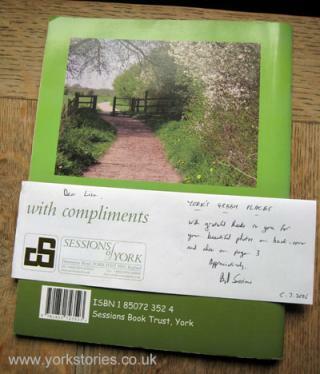 Which is why I have this treasured copy with a compliments slip, with a note from Bill Sessions. ‘The former owner, Bill Sessions, was an outstanding supporter of wildlife conservation in York and the Panel would hope that biodiversity enhancement ideas can be incorporated within the site. To such affect the Panel would like to see the best use is made of the land strip sloping down to the River Foss along the western boundary. That would seem an appropriate tribute wouldn’t it. And maybe the window-smashing vandals can be encouraged to plant trees instead. End of an era for Sessions of York, York Press, 2011. The new owners moved to Lincolnshire, apparently unable to find suitable premises in York. Sessions’ machinery division was bought by Adrian Barraclough and trades as Sessions Label Machines. 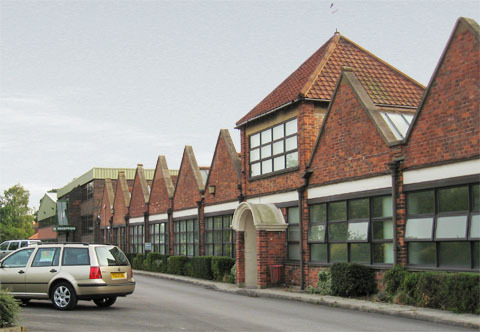 The commercial printing division was merged with Barringtons of York. So Sessions lives on, kind of, just not in the Sessions family and not here on Huntington Road. The YNEP comment will be by my YNET colleague Barry Potter, as Bill was such an avid supporter of YNET and all things green. I probably have lying in the roof somewhere repeat letters from Bill over the years asking me (most politely) to get on and recreate ‘The Strays & Ways of York’ that he had helped write and publish back in about 1967, unfortunately people have borrowed all the copies I’d managed to find and now all I have is a poor photocopy someone put in YNET’s copy of ‘A Register of Green Sites in York’ that my friend Martin Hammond produced in 1991. The booklet promoted the concept of an ‘Outer Green Way’ linking the Strays, river bank walks, the Ings and existing parks and suggested this for the York Development Plan. Bill was always such an optimist! I hadn’t realised Sessions had closed which shows how much attention I pay to what’s happening locally most of the time – when I first moved to York we lived nearby and I remember being told by the man in the newsagent that it was a local institution of the kind which York seemed (to an outsider) to specialise in – family business, sound values, strong local identity and affection. Sorry that it’s gone and the factory is falling into disrepair. York has changed so much in the 18 years since we moved here, not always for the better. That Quaker thread which ran through the life of the city seems to be losing its strength and identity.